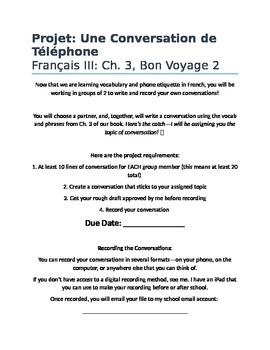 I created this conversation project for my French III students to coincide with the Bon Voyage, Level Two series (Chapter 3). For the project, students worked in partners to write a 20-line dialogue in French about a topic that I provided them (10 sample topics included). Then, students recorded their conversations using their smartphones, a computer, or my own personal iPad for students who didn't have access to other sources. My students LOVED this project, and they found it very funny to hear each other's recordings! :) It is a great way to get them speaking and practicing pronunciation.